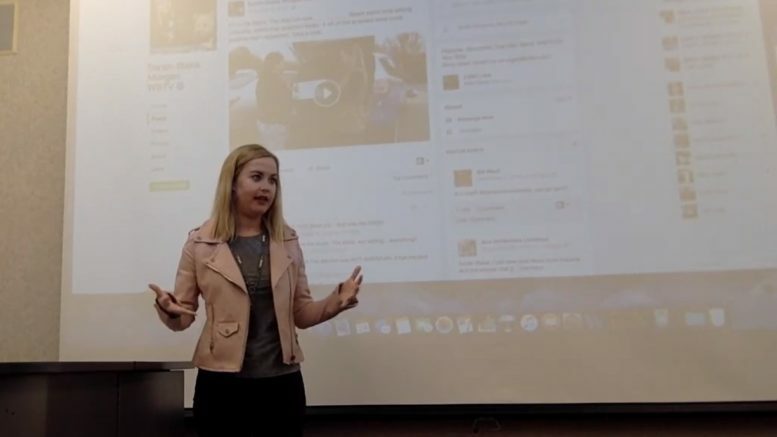 A reporter and multimedia journalist for WBTV Channel 3 news in Charlotte spoke to a group of Gardner-Webb communication students on Tuesday, January 24. Sarah-Blake Morgan, originally from Tampa, Fla., has been a reporter and multimedia reporter [MJJ] for five years. She attended Lee University, a private university in Cleveland, Tenn., where she studied telecommunications as an undergraduate. “We didn’t really have a huge broadcast program, so my internships really helped me out,” she said. To learn more about Sarah-Blake Morgan or being an MMJ, contact her at smorgan@wbtv.com. Be the first to comment on "Sarah-Blake Morgan Speaks to Gardner-Webb Students about Multimedia Journalism"